A prospective before-after study at the 900 bed St. John’s Mercy Medical Center evaluated the impact of an HPV intervention focused on the terminal disinfection of rooms used by patients with multidrug-resistant organisms and C. difficile. HPV was introduced on a priority scale accounting for the target pathogen and the risk associated with the unit. Due to local prevalence, most of the rooms decontaminated using HPV were vacated by patients with C. difficile infection (CDI). Hence, the authors evaluated the impact of introducing HPV on the rates of CDI. The rate of CDI was static prior to the introduction of HPV, with no significant change in rate from 2007 to 2008 (Figure). Hence, this study was performed in a truly endemic setting in contrast to a previous study of a similar design by Boyce et al., which was performed in a “hyper-endemic” setting. When HPV was introduced in 2009 (along with enhanced conventional methods comprising quadruple bleach disinfection for rooms that could not be disinfected using HPV), the rate of CDI fell by 37% from 0.9 to 0.5 cases per 1000 patient days (p<0.0001) (see chart below). Chart showing the rate of C. difficile infection before and after the implementation of HPV or quadruple bleach disinfection for the terminal decontamination of patient rooms. Recent data have shown that patients admitted to rooms previously occupied by a patient with C. difficile are at an increased risk of developing C. difficile infection. Thus, it seems logical that improving the efficacy of terminal disinfection would result in reduced rates of CDI. Furthermore, the scale of reduction in CDI incidence was remarkably similar to the study by Boyce et al. 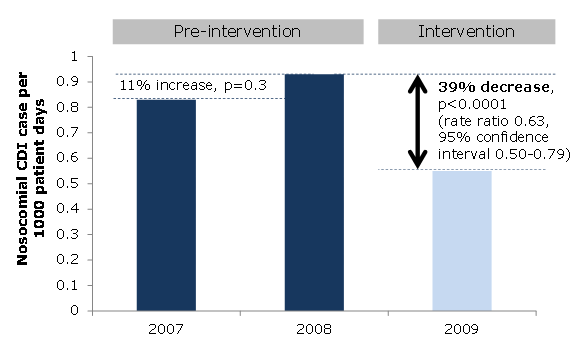 (37% vs. 39%), though in this previous study, the 39% hospital wide reduction was not statistically significant. The major criticism of the study is that HPV and quadruple bleach disinfection were implemented more or less simultaneously so it’s not possible to attribute the reduction to HPV alone. This is complicated by the fact that quadruple bleach disinfection was implemented for all C. difficile rooms in mid-2008, 6 months prior to the introduction of HPV. So, it is possible in theory to do a sub-analysis of corresponding months during the period when quadruple bleach disinfection alone compared with HPV plus quadruple bleach disinfection was in operation. However, this sub-analysis was not performed. A previous study by the same group showed that quadruple bleach disinfection was necessary to eliminate A. baumannii and MRSA from surfaces, and that HPV was microbiologically superior to quadruple bleach disinfection. Thus, since HPV has time and efficiency savings compared with quadruple bleach disinfection, it is cost effective to use HPV in this setting. The authors undertook a careful evaluation of hand hygiene and glove / gowning compliance, showing that these were not significantly different comparing the pre-intervention and intervention periods. They also evaluated the use of key antimicrobial agents and found that there were small but statistically significant changes in antimicrobial usage, which may have confounded the association with improved disinfection. However, levofloxacin use (one of the high risk CDI drugs) increased significantly in 2009 and there was still a significant reduction in CDI. The paper includes some useful data on feasibility and safely aspects of implementing HPV, and the ‘priority scale’ (Appendix) for deciding which rooms were disinfected using HPV is rational and will help other hospitals decide on a similar priority scale. Several other points of interest are reported. For example, the significant reduction in CDI was achieved whilst adhering to US C. difficile control guidelines, which recommend the use of gloves and alcohol based hand products (rather than hand washing with soap and water) for treating patients with CDI in endemic settings. They also held patients who had CDI in contact precautions for the duration of their stay, not just until symptoms resolved. Article citation: Manian FA, Griesnauer S, Bryant A. Implementation of hospital-wide enhanced terminal cleaning of targeted patient rooms and its impact on endemic Clostridium difficile infection rates. Am J Infect Control in press.